On a Wednesday morning in November 2008, two men met at Bengaluru’s Leela Palace Hotel. 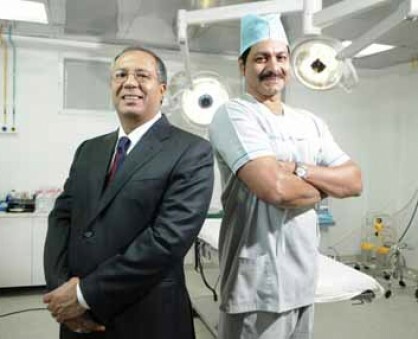 One was Suresh Soni, an investor and the other was Mahesh Reddy, a senior medical professional. But this wasn’t a usual entrepreneur-pitches-to-investor scenario; it was the other way round. And at the end of the day, the two had decided to partner to form Nova Speciality Surgery, a chain of multi-specialty standalone day and short-stay surgical centers. Soni, 50, from GTI Group, a U.S.-based private equity firm, had led the investment in Air Works Engineering India, from 2007 onwards. When his colleague in New York received a memorandum from a popular skin care clinic in India, it got him thinking of higher revenue-generating investment opportunities in healthcare. These were based on GTI’s model, which involves investing and incubation. Investors join as CEO, set up the company, bring in institution capital, domain experts and finally step back. Daycare surgery, which is popular in the U.S., caught his attention. After spending two months bouncing the idea off 100 doctors in India, Soni met Mahesh Reddy, 45, a specialist in shoulder surgery, on that fateful November day with the same proposal. “I had been thinking of starting a hospital, but wasn’t tickled by projects coming my way. This, I thought, would be the future of healthcare delivery in India,” says Reddy, Executive Director, Nova Specialty Surgery. Having him on board brought Nova credibility and the business took off in March 2009. In May 2009, its maiden facility in Bengaluru was launched. Its model is a slight improvisation of what exits in the West as it has added primary care services (consultation, OPD, diagnostics, pharmacy) which are not typically attached to surgical centers. Plus, all centers have facilities for the short-stay required in special cases, at no extra cost to patients. “We are at the heart of what most large hospitals do,” explains Soni, Chairman and CEO, Nova Medical Centres (parent company). Today, Nova undertakes all specialty surgeries (except neurological and cardiac), including joint replacements, from confining services to minimum invasive surgeries initially. “We had the technology, skill sets and capabilities for more, but chose to give patients confidence in the system first,” explains Reddy. In the U.S., ambulatory surgeries started in the late ’70s and ’80s, and joint replacements by late the ’90s. “It is only over the last five years that certain procedures happen in nursing centers, like cataract surgeries where patients go home the same day,” he points out. As a safeguard, Nova doesn’t admit patients with previous cardiac history. Spotting an opportunity for daycare surgery in India, venture capital firm NEA first invested (amount undisclosed) in Nova in mid-2010 and have continued to support it in later rounds. “Our diligence showed a $1billion addressable market size for Nova in the top 10 Indian cities due to large demand-supply gap,” says Bala Deshpande, Senior Managing Partner, NEA. Funding apart, the founders knew they would need a sound network of doctors for patient acquisition. Each Nova center is a 70:30 partnership between the company and participating surgeons who can invest Rs.5 lakh or Rs.10 lakh each. Incentives for doctors include higher professional fee (30-34 percent, as compared to 10-15 percent in regular hospitals), full convertible debentures which become shares and profit sharing, 8-10x of investment (also performance-linked). A typical Nova center breaks even in 12 months. “No medical institute gives equity to doctors,” says Soni. Convincing them continues to be a challenge and still is, since they can’t advertise for doctors either. The obvious benefits of Nova’s differentiated model as opposed to self-owned clinics, which end up as real-estate value post-retirement, has been Soni’s big selling point. “I wrote to the CEOs of insurance companies and have got all our 800 procedures accepted by them,” he mentions as a hurdle they have successfully tackled, a first for the industry. Mandate by insurance companies in India require compulsory overnight stay, for patients to get reimbursed. “This bed business is a function of the ecosystem. It’s a phallic symbol,” says Soni, who feels medical care is provided by technology, skilled surgeons and back-up systems, not real estate. Deshpande is optimistic on Nova’s format for India. “It is superior to existing hospital-based models, since it has significantly lower capital and real estate intensity which allows it to deliver medical care at a lesser price to patients compared to hospitals,” she says. Adding to its benefits is higher capital efficiency offered to shareholders. “World-over, ambulatory surgery is clinically accepted and proven, and hospital-acquired infection rates are lower too,” mentions Reddy. “It is a structured concept. Patients go by what a doctor recommends,” adds Jaya Bhatt, Founding Doctor, Nova Specialty Surgery, in context to patient skepticism. Nova’s processes too are less cumbersome and time-consuming. Nova requires its surgeons to carry a minimum of eight years of experience (post degree), in specialized surgery. Doctors are not bound by contracts, and are free to continue practicing elsewhere. Plus, they get two-hour OPD slots. Those who don’t invest can be part of the system and use facilities as visiting faculty. While Deshpande’s sold on the scalability of its model, a key challenge she foresees is to ensure rapid growth while simultaneously ensuring that it creates a robust platform in terms of systems, processes and adherence to best medical practices. In August 2011, it acquired 51 percent of Ahmedabad-based Pulse Woman’s Hospital, specifically the IVF part, making it a separate entity, Nova IVF, under the parent company. Looking futuristically, Deshpande says, “About 70 percent of surgeries in the U.S. are done in a daycare environment and India should follow a similar trend.” The founders have aggressive expansion plans, which include raising money to scale to 25-30 centers in India and the Middle-East over five years. With healthcare continuing to be a growing market, the founding duo seems to have found the right niche to operate from.